I had to come see if this was Cinque Terre. I was on vacation in the area, had tickets bought for the excursion; but, got sick and had to cancel. Maybe, maybe I'll have another opportunity...so until, ...I live in admiration of great shots. Beautiful capture of the blue hour. The queen of views of the Cinque Terre national park in italy. 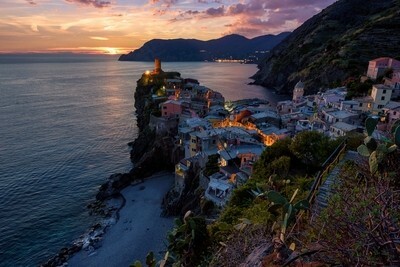 Vernazza is a fiherman village, colorful and full of tourists the whole year.